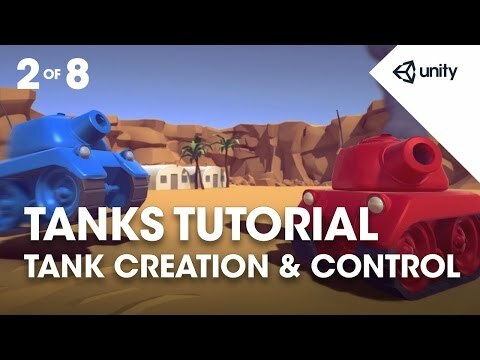 Phase 2 teaches you how to add the tank artwork and components to let the player control the tank. So phase two - tank creation. components in order to function. so you can see this kind of green outlined cube here. so it can bump in to objects. so like shooting, things like that. that we're going to write a bit of. it's going to drive around like that and play the audio. that we're going to drag and drop on there. and we will recap in a moment. jump in to the Models folder. and drop that in to the hierarchy specifically. prefab with a predetermined position. isn't a prefab, it's just a model. you can zoom right in to the thing that you're looking at. we can start working on it. or if you wanted to extend the game, several tanks. tank on to a particular layer. and at the top of the inspector you'll see a drop down for Layers. but we want you to set that to Players. And why do we do that James? but you will do later. or the ground or anything else. We just want to blow up the tanks. So it's just going to find the tanks because they're on the Players layer. the parent object of the tank. we've set the layer to Players. because that's going to be the one with the collider on it. component that we just saw. So there's a few ways to add components in Unity. with all of the same components in it. then you can start typing and it will auto-complete for you. to get straight to rigidbody. these components that we're going to reference throughout the day. equivalent because it won't do what you expect it to do. so I'm navigating using up and down arrows on the keyboard. I can also press return to choose one that I want. and the physics engine's just another example of one of those. scripting that controls the rigidbody system. by checking the Y box by Constraints. So make sure you have Constraints expanded. open these up to see further settings. and Zee axis, as you guys would say. in order to steer it, so we can just lock those off. just use the rigidbody to force it in to place. we need to constrain positions and rotation. and X and Z or Zee. is there to say 'hey this object is governed by the physics system'. or any information until we have something called a collider on there. So it's another component that we need to add. and I'm going to type in 'Box' this time. A Box Collider is what we need here. primitive colliders for a lot of these things. for pretty much anything at all. is governed by what we call primitive colliders. cubes or boxes, in a sense that colliders are called. And that's exactly what we're going to do with the tank. shape for it's collision or what it's going to do. and that's going to be just fine. and we're going to add that on there. that it's not quite the right size. the collider needs to be as a result'. 'oh Unity, why don't you set it to the right size?'. ways that we can setup our collider. which is this toggle on and off here. I'm going to give you a value of (0, 0.85, 0). And then in the size (1.5, 1.7, 1.6). size to fit and encompass the tank. the centre to (0, 0.85, 0). X, Y, Z order, or if they're colors, R, G, B order. And then we've changed the size to (1.5, 1.7, 1.6). that's got two different tanks in it. and we're going to do that in code later on. being for our engine sounds. and that gets me straight to 'source' and I can hit return. so we want to check Loop. is what we see next. project that this is going to play back. it's this little target-looking thing over on the right here. that are valid to assign it to. but you can put in whatever is in those brackets. it will choose it and close the window at the same time. to assign them like that. to make sure that it constantly plays. is the sound of charging up the weapon. have a variable range, you can hold down Fire. the end it will just fire anyway. These tanks are going to work just the same as that. or you can go to Audio - Audio Source to add a second one. just to collapse them to make space. box collider and my first audio source. So I'm definitely working on the second one. So we're not going to assign that there. we don't want this particular audio source to play anything at all. telling it which keys on the keyboard to use and things like that. asset in the project, that's really important. We can't just leave it as a game object in the scene. denote where all of the intractable things are. we'll save it as a prefab. So if you select the Prefabs folder on the project. drag and drop it in to that prefabs folder. like that, and let go. this blue cube means it's a prefab. is that the tank is now highlighted in blue. and they also get highlighted in blue. prefab options at the top. you can update the asset that you just made. So just a quick recap. We have added another audio source for our sound effects. to put the tank in to that Prefabs folder. it's got everything that we just setup. and then you can just spawn as many as you need to. And hopefully everybody has saved their scene. If not please do that now. to see some dust trails coming off of these. So we've created those for you. made up of 3D meshes. So they're just for effects. that we've got here has a number of modules. this particle one works, we're not going to dwell on it too much. so I want you to do that as well. it on to the name Tank in the hierarchy. so you can see a bit better. appear as a child object here. it around I'm just going to show you briefly. you want to emit at any time. a bunch per unit I'm getting 10 at a time. and they keep, kind of, moving around. they disappear, what's going to happen. that they're getting smaller using this curve. So that's our basic particle system. Select it and then duplicate it. and then we're going to rename those two. they have the same name, no big deal. So I'm pressing Return on the mac to rename. In the Prefabs folder we've dragged our DustTrails on. And we've made then child objects. so these dust trails will get dragged around by the tank. And the distance will cause them to emit particles. And we've renamed them Left and Right DustTrails. So we're jumping ahead here with the slides. LeftDustTrail should be (-0.5, 0. -0.75). And the position of the right one is (0.5, 0, -0.75). It's probably easier for me to leave those up. We just set the position here in the transform panel. I'm going to jump back to the slide for those positions. RightDustTrail is (0.5, 0, -0.75). It should look like this and this. controlling our tank, so I'm just going to quickly save my scene. Tank folder for this script. governing how the entire game will play. in charge of allowing us to control the tank. to make them do stuff. There's a bunch of different ways that we can do this. is just a drag and drop method. and it's going to make sure that I drag it on to the right object. and drop it on to Tank. appears as one of the list of components there. in your project, ignore it, don't touch it. two versions of the scripts. version that we're going to work on today. you'll see that there's two of everything. It just avoids that confusion. then you can just go through and read all those comments. and we're going to setup turning. to our first bit of scripting. There's a few different ways you can open up a script. if you haven't setup something different. difference for the kind of stuff that we're going to be doing. it's all going to work out fine. the two throughout the day. that there's some of it in grey. Now why is that? Well that's what's called commenting. So a comment is there to basically disable part of the code. just put in what's called a comment. 'hey, this variable is cool'. 'this variable rocks, it's my favourite variable'. with someone, comments are useful, obviously to leave notes. then that's another good thing to do. disabled a bunch of code to start out. we just need to remove the comments. start of the comment, but you also need to remove the end. So on line 13 delete those two characters. So it uses those to create what we call a block comment. and then the reverse at the end. So we've done that to disable that whole section of code. Once you've done that you should be good to start writing. The other thing to mention is single line comments. // will allow you to do a single line comment. what we're going to do in each function. a line and get started. ignore it so you don't have to worry about those at all. a bunch of variables at the top and these are member variables. on all of the variables. this belongs to the class, so you can use it in any function. will only work within the function that they're created. However if you see an m_ that's going to be useable anywhere. so you can see that we've got 7 different public variables there. These are all our public variables setup. them and reuse those values throughout the script. then they're likely to be private variables. and tweak how the game behaves, that's why they're public. to just create functionality within the game. Let's go from top to bottom and explain what these variables are doing. and generally that's what we recommend that people use with Unity. which is a Java Script-like syntax for Unity functions. But we prefer to use C#. Okay, so, first off our public variables. So we have public, that's the accessibility. and then we have PlayerNumber. or m_ whatever it is. and remind you to do that. of the variable name, and I'll show you that in a moment. The PlayerNumber, what does that do? which controls are assigned to which tanks. there's going to be two tanks, a red one and a blue one. a 1 on it will be governing tank1'. and the return key for the other tank. and assign those controls and you'll see how that works briefly. Then we've got some more self explanatory stuff. So Speed is how fast the tank's going to drive. TurnSpeed, how many degrees it's going to turn over time. you're stopping, again, we'll play those two different clips. And then we have pitch range. you usually have to parse in a sting for the axis name. then you've got fire buttons, Fire1, etcetera. I'm just going to show it really quick. Edit - Project Settings - Input. a UI 1 and 2 controls. for example spacebar for firing1. and it's got Fire2, which is a return or enter key. we need to use a string, which is it's name. for player1 we need to say input.getAxisHorizontal1 as a string. And then likewise we've got the TurnAxisName. Then we've got a rigidbody component. that to actually move the tank around. because it's a number variable. Finally we've got the OriginalPitch. you're going to end up with a very strange sounding tank. when the scene very first starts. to store that reference to the rigidbody. to a particular component on a particular game object. and get a component reference to that stored if you really wanted to. these angled brackets', Rigidbody being the type. Okay, so the next function is OnEnable. but before any of the updates happen. is we're turning them off. for the next round OnEnable is called. rigidbody to be kinematic when we turn the tank on. If it was kinematic then we'd have trouble moving it. the rotation to kind of turn them around. hitting them, moving them around. which we'll use to drive the tank around. and dies, as we put it. force being applied to it, so we use IsKinematic. basically means no forces can affect it. if just hit and fires out the ball. physics but you don't want physics forces to affect. whilst it's invisible, and you'll see that as we go through the day. are reset the values for Input. we need to commence driving. After OnEnable and OnDisable we've got Start. that's going to call the correct axis. there just saying it's keyboard axis for player1. so you can just extend that. so our tank doesn't keep on getting higher and higher pitched. a reference to that component'. So why aren't we doing that now? Well if you remember the tank has two audio sources. is it'll pick the first one it finds. and guarantee that we know what we're doing. and drop it on to the script. And we'll do that after we've finished the script. But this is a reference specifically to that. to just grab the pitch property of that component. you can adjust it here, it's just this little slider. is as people drive around. And that's our Start function. is store the values of Input. calculated so that's the best place to have it. So Update is running every frame. 60 frames it's running that many times per second. so you'll see that in a moment. As James said we're going to use that to get the Input. as I've started typing this I've got this autocomplete. and just double check your code. and I can select the one I want, hit return to finish it off. So you remember we setup that string? the value of two axis and it's storing their values. where we actually move the tank. is put a call to the EngineAudio function. and we're going to complete it. a few times to move down. then we want to play the EngineDriving sound effect. or vary the pitch if the wrong one is being played. is being played then we need to do something about it. to work out whether we're moving or whether we're not moving. depending on what you want to call it. so we've got the structure for us there. I tend to put them on a new line. it's a little tip for Monodevelop. for us to carry out the instructions in this if statement. So that first part is Mathf.Abs of the MovementInputValue. if that is less than 0.1f. just the positive version of it. if it's -0.1 then it'll also be 0.1.
with obviously 0 being a kind of idling. holding the up or down keys on the keyboard. and when I'm holding up it'll be 1.
then you know that you're driving somewhat. And the same for turning. that the tank is moving. Also we'll want to deal with the case where the tank isn't moving. is we're going to put the else statement. I can just hit undo and move them where I want. to do it slightly differently that's totally fine. if the tank isn't moving. the if is dealing with if we're idling. we're going to need another if statement. that we're currently playing is driving. So that's what we're going to check for next. after the opening brackets and before the closing one. so you can see that a bit more easily. On this line we're going to put in a new if statement. 'you know that audio source that's on the tank? Check what clip it's playing'. so we need to do something about that. m_MovementAudio.clip and then set that to EngineIdling. So m_MovementAudio.pitch and that is equal to Random.Range. We're going to write this out first and then I'll explain it afterwards. I'm just going to try and fit that on the screen for you all. Don't forget the semi colon at the end of the line. and the original pitch plus the range that we gave it. 0.8 plus the PitchRange is going to be 1.2.
value between 0.8 and 1.2.
then this will still work, whatever we do with it. in to the code to change. play that clip again, because it's going to stop. you do just need to call the play function. capital letter P for Play there. That is all we need to do for when the tank is idling. so that's within the brackets of the else statement. that's taking care of that. are my EngineDriving and EngineIdling. it's currently driving we set it. So we check is the clip currently driving? to do is just retype that and retype that one. don't do that, play the EngineDriving. and we always want to make sure we play it. So we've got the same two lines that we did before. again in case you lose any work. value of MovementInput is less than 0.1f. treat this number as a floating point value. so put an f at the end. anyone still typing, they can still see it. I'm just going to move in to the FixedUpdate function now. In FixedUpdate, what does that do? what it's doing is running every physics step. instances where it updates itself every second. move the tank and we want to rotate the tank. handle that in to the FixedUpdate function. Move and Turn in to those, and we'll write those in a moment. need to do is put calls to those functions. screen so you can see them move easily. And they are Move and Turn. and we need to move it. vector that the tank is going to move along. So for that we create a vector3 variable. What is a vector James? A vector, in our case it's 3 values, X, Y and Z.
so that's a vector representing the forward direction of the tank. Okay, so what is that doing? then it's going to go backwards along it's forwards vector. it's going to move the amount of Speed per frame. So per frame it's going to move 12 units. it's going to move 12 units every second. So it's basically just a way of smoothing that out per frame. so don't worry about that too much. So what are we going to do with that vector? absolute position that you give it. to itself and it's going to start moving around the world. Okay, so let's move on to the Turn function. and it'll be quite easy. And again we're going to multiply it by time.deltaTime. it actually deals with them in something called a Quaternion. and that's exactly what we're going to do right now. and then I'm going to give it an X, Y and a Z value. just calculated that as James said, that's turn. we'll put in our variable name. pretty cool, but we're not going to do that. This is not Rocket League. So instead we're just going to put in 0f there. and that's what this quaternion is expecting. between the variable and the function. it doesn't actually make any sense. by the turn rotation that we've created. and then we can return to the editor. at the bottom in the console window. save my script and switch back to the editor. and see if I've made any errors. and then press Play at the top. and you'll get an error at the bottom. You'll see this unassigned reference exception. we will then assign something to them in the editor. add an error in to my script. that I've got right now. and it'll tell me a rough approximation of what I've done wrong. three values that it was expecting. real problems that I've got. to the actual movement functions. when we're idling it's going to play the right clip. and obviously turning as well. fixed all of our errors thanks to the wonderful helpful team. the script and it's public variables. So I'm just going to show you that script as a component once more. So TankMovement should look like this. and if I change them here. then they're not going to change in the script. What's in the inspector always overrides what's in the script. movement audio and engine idling and driving. audio source that we want to use. you can see it says Tank (Audio Source) where I'm holding my mouse button down. Drop it on to Movement Audio. out of that audio source component. the selection window, this thing. the like named clip there. were what's called an unassigned reference. So we've done that, so I can clear my console. And if I press Play. is varying but only slightly. looking at the same screen, playing the same game. sound horrible, so we vary both pitches at the same time. hopefully avoiding a lot of phasing with this approach. So that is our TankMovement script. going to jump back and a quick recap of those. it on to the Movement Audio variable. to choose EngineIdle audio clip. And then for driving we did the same. on this slide is to update the prefab. the collider and the rigidbody. got the different variables of that script assigned. is more emboldened than this. these are different to the prefab. that these aren't bold any more. and then you can save your scene. and then we're just going to save our scene, File - Save. been able to play test the game. I'm just going to turn that down. you know, it's off to find it's destiny. So that's that done, we've saved our scene. And that's the end of phase 2.
public int m_PlayerNumber = 1;              // Used to identify which tank belongs to which player. This is set by this tank's manager. public float m_Speed = 12f;                 // How fast the tank moves forward and back. public float m_TurnSpeed = 180f;            // How fast the tank turns in degrees per second. public AudioSource m_MovementAudio;         // Reference to the audio source used to play engine sounds. NB: different to the shooting audio source. public AudioClip m_EngineIdling;            // Audio to play when the tank isn't moving. public AudioClip m_EngineDriving;           // Audio to play when the tank is moving. public float m_PitchRange = 0.2f;           // The amount by which the pitch of the engine noises can vary. private string m_MovementAxisName;          // The name of the input axis for moving forward and back. private string m_TurnAxisName;              // The name of the input axis for turning. private Rigidbody m_Rigidbody;              // Reference used to move the tank. private float m_MovementInputValue;         // The current value of the movement input. private float m_TurnInputValue;             // The current value of the turn input. private float m_OriginalPitch;              // The pitch of the audio source at the start of the scene. // When the tank is turned on, make sure it's not kinematic. // Also reset the input values. // When the tank is turned off, set it to kinematic so it stops moving. // The axes names are based on player number. // Store the original pitch of the audio source. // Store the value of both input axes. // ... change the clip to idling and play it. // ... change the clip to driving and play. // Adjust the rigidbodies position and orientation in FixedUpdate. // Create a vector in the direction the tank is facing with a magnitude based on the input, speed and the time between frames. // Apply this movement to the rigidbody's position. // Determine the number of degrees to be turned based on the input, speed and time between frames. // Make this into a rotation in the y axis. // Apply this rotation to the rigidbody's rotation.